Indulge in the sights, sounds & refined tastes of the South of France on a 15 day river cruise from Lyon including a unique wine tasting in Tournon Castle. Your friendly crew await to welcome you aboard your luxurious Scenic Space-Ship for your journey through France’s iconic south. Freechoice: This morning explore Beaune, including a visit to Les Hospices de Beaune. Alternatively, visit the estate of Château de Savigny-les-Beaune to see the impressive collection of motorcycles, race cars, and fighter planes. Freechoice: Experience the magnificent Château de Cormatin, boasting beautiful gardens and water features. Alternatively, join the intelligent hounds and their owners in nearby quaint villages to locate and sample French truffles – a gastronomic delicacy. Enjoy leisurely cruising to Mâcon this afternoon, or opt for a class in French cuisine in Scenic Culinaire on board. Alternatively, cycle from Tournus to Mâcon and meet the ship there. You're sure to love Mâcon. Be fascinated by its history and delighted by the surrounding picturesque farming region acclaimed for its five wine appellations and gastronomy. Freechoice: Retrace the traditional life of the region on your visit to the Bresse Museum, or enjoy wine tasting in the celebrated Beaujolais region. Alternatively, visit Cluny, a village in Burgundy that was constructed around the great Benedictine Abbey, once the world's largest basilica. Awake today in Lyon, the gastronomic heart of France. Freechoice: Discover Lyon's historic significance by traversing its hidden Traboules – secret passageways that date back to the 4th century, and visit Notre Dame Basilica, offering a fabulous vantage point for views across Lyon. Alternatively, walk the cobblestone paths of yesteryear in the medieval hilltop town of Pérouges. Or, if you wish, visit the exclusive culinary school of Paul Bocuse and perfect the art of French cuisine before sampling some of the delicious fare. Lyon's Botanical Gardens and Zoo are perfect for a leisurely bike ride this afternoon. Enrich: Experience the French extravaganza that is the can-can amidst other performances when you are treated to the exclusive gala spectacular, Scenic Rouge, under the big-top onshore this evening in Lyon. Cruising from Lyon you'll have the opportunity to soak in the picturesque riverside panoramas as you glide effortlessly toward Tournon. You may choose to visit Scenic Culinaire whilst cruising and pick up a trick or two to add to your culinary prowess. On arrival in Tournon enjoy a fun lecture on the French paradox and etiquette. Sundowners: Overlooking the Rhône, Tournon Castle is a must-see for visitors, both for its historic interest and its breathtaking outlook. Enjoy an afternoon aperitif on the terrace of the castle accompanied by local musicians. You'll find it a great soundtrack to a truly awe-inspiring backdrop. Freechoice: Enjoy a unique wine tasting in the wine cave of Tournon Castle, or join a guided walk of Tain l'Hermitage including a tasting at Valrhona Chocolates. You could also enjoy a group bike ride along the Rhône to neighbouring villages, or hike the famed Saint-Joseph vineyard for a tasting of the delicious varietals amidst the vines. Scenic cruising to Viviers this afternoon. Enjoy a walking tour of Viviers including an organ recital in the town's cathedral. Freechoice: Explore the Ardèche National Park and immerse yourself in the Caverne du Pont-d'Arc Museum, or visit the aromatic Lavender Museum. If you're feeling adventurous, you can canoe through one of Europe's largest natural canyons, or drop into the beautiful provincial town of Grignan. 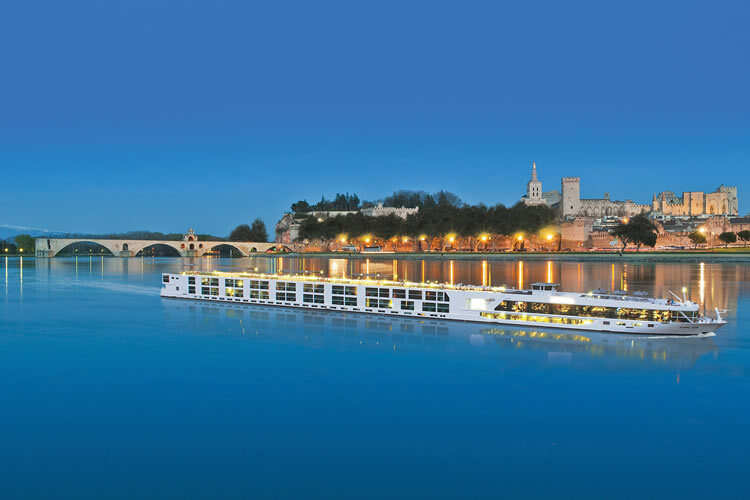 Freechoice: Join an exclusive cooking class in Scenic Culinaire on board, or sample the celebrated wines of Châteauneuf-du-Pape at a charming Côtes du Rhône vineyard. Enjoy picturesque cruising to Avignon this afternoon. Then take a walking tour that includes a visit to the city's architectural jewel, the Pope's Palace. Freechoice: Shop with a Chef at a local food market and cook up a storm in Scenic Culinaire with your fresh ingredients. Alternatively, drop in to the villages of the Luberon region including Gordes and l'Isle-sur-la-Sourge, or take an excursion to Uzès and Pont du Gard. Explore Avignon at leisure this afternoon. Enrich: Be treated to a truly unforgettable experience at the prestigious Pope's Palace of Avignon, among the most visited sites in France. After the doors close to the general public, you'll be ushered in for an exclusive gala dinner and classical concert in the grandiose Grand Tinel room. Choices today include the spectacular La Camargue National Park. Freechoice: Enhance your French cooking skills by joining a lesson in Scenic Culinaire. Or take in the wild beauty of Saintes-Maries-de-la-Mer and visit the 60 hectare Parc Ornithologique whilst there. You can also choose to visit the fortified Mediterranean village of Aigues-Mortes. This afternoon, relax on the Sun Deck while cruising roundtrip from Tarascon towards the Mediterranean Sea. Tonight, a Camargue gypsy band performs live for your listening pleasure on board. The riverside town of Tarascon exudes a charming medieval character. Freechoice: Explore the artistic heritage of Arles, and see the striking Arles Arena, or stop in at the pretty hilltop village of Les Baux before touring a charming family-run olive farm to sample their delicious products in a delightful setting. Alternatively, pay a visit to Saint-Rémy and Saint-Paul de Mausole Monastery where Van Gogh was held for a year. Explore the charming riverside town of Tarascon at leisure before an afternoon of cruising. Relax in the on board wellness centre, take a lesson at Scenic Culinaire or simply soak in the scenery as you cruise through this delightful region. Terms and conditions apply. All offers are subject to availability and operators booking conditions. Prices are based on two passengers sharing the lead in grade stateroom unless otherwise stated. All discounts have been applied to fares displayed. We charge a one-off small £20 booking fee. That’s it - nothing more and no add ons when you pay the balance. E&OE. ABTA P6710.